Disclosure- I received a party box filled with items to host a DisneySide party from Mom Select and Disney. All opinions are 100% my own. Thanks Mom Select and Disney! I found some great Disney Villains headbands and jewelry on clearance for $2 each at Claire’s so I snatched it right up. Each girl received a headband (Cruella or Ursula) and a matching bracelet and necklace. For background music I found this great, free website that had several great playlists of Disney Villains songs. It was perfect. Each party guest received a favor bag with lots of goodies in it. I made notebooks with our invitation design on the cover so the girls could remember the party. There was also villain color nail polish, heart shaped candy, villain Jelly Belly jelly beans, heart rings and bracelets, a heart pencil, some printed games such as a villains word search and coloring page, Disney Villains lip gloss, and a favor box filled with candy. Here are the Disney Villains labels I made for the favor boxes. I also used them on upside down paper cups stacked in a pyramid that the girls were supposed to try to knock over with bean bags but we ran out of time. Most of the decorations I used were images I printed off of the internet via searching for Disney Villains or decorations that were sent in my party kit. For the magic mirror pictured below I bought an inexpensive silver charger plate at Michael’s (it was on sale for under $3 I believe). I printed a picture of the magic mirror from Snow White and taped it to the center of the plate. It looked great, only cost a few dollars, and since I only taped the picture on I can reuse it for something else. Heart gems, battery operated tea light candles, and red & white heart balloon weights all from the dollar store made for some simple yet elegant centerpieces that didn’t take up too much room so the girls still had plenty of room to craft. I bought a plan wood frame at Michael’s and painted it black. Then I sponged on purple paint. On top of the purple paint I sponged on silver paint and finished it off with some purple glitter paint to create a photo booth for the girls to take pictures. I hung a simple purple plastic tablecloth as the backdrop. Easy peasy! Here are the signs I made for all the food I served. Below you can click to download the signs to make them yourself. In addition to Scar’s Soda and The Wicked Queen’s Water, I served Poor Unfortunate Souls Punch. To make the punch I put in two parts Green Hawaiian Punch to one part Sprite, added ice, and stirred. When we served the punch we put a gummy worm in the bottom as the Poor Unfortunate Soul. Plenty of munchies to snack on! I tried to balance all the sweets with some healthy fruits, veggies, and hummus. The Gaston’s Grilled Cheese ended up just being cheese sandwiches because my husband (who was supposed to be making the food) injured his arm the morning of the party so we just cut the cheese sandwiches into heart shapes and served them that way. No one seemed to mind! The moms appreciated having healthy deli sandwiches for dinner in addition to the veggies and hummus. To make the tentacle hot dogs we just cut each hot dog lengthwise twice about 1/3 of the way up to create 4 “tentacles”. We then boiled the hot dogs until they were cooked. So easy and the kids loved them! I’ll admit I over planned for this party because I had so many ideas. I had planned on having the girls make bookmarks but we ran out of time so I just had them take the printed bookmarks home so they could finish them later. Simply punch a hole in the top, add some ribbon and beads, and viola! 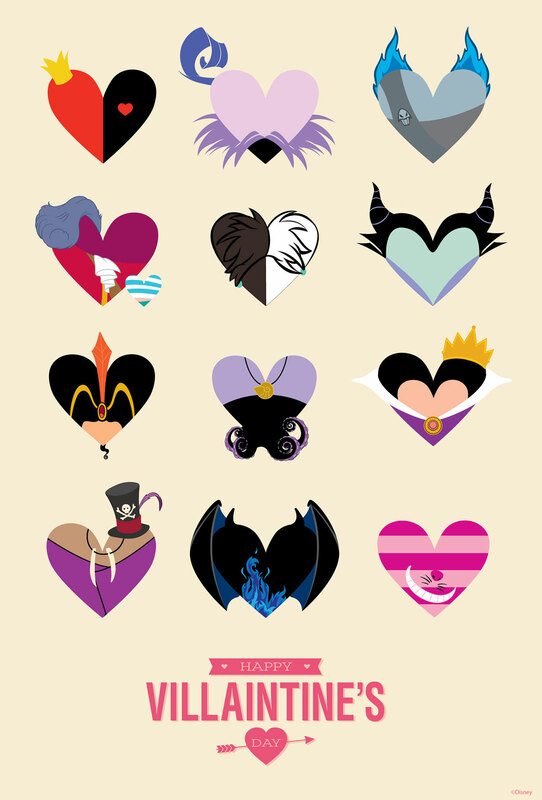 Download the Disney Villains bookmark template (no words, just the pictures) here. And this is the original Disney Villains file I used to create it, to create my invites, and create the cover of the journals that I gave as favors. I bought these pretty plastic wine glasses at The Dollar Tree in packs of 2! They were perfect for our Queen of Hearts glasses. I gave the girls heart shaped gems and some glue and they each made a beautiful glass that they could use to put trinkets in. The girls also painted wooden frames that I bought from Michael’s for $1. Once the paint dried they put Villains stickers on them to decorate their frames. The girls will then put pictures from the party in their frames once I have the pictures printed. Such an easy craft but the girls really enjoyed it. My favorite craft of all was the Mickey head dot art mugs. The mugs were $2 each at Michael’s. I had looked for mugs in the dollar store but they didn’t have enough plain white ones. I ended up liking the ones from Michael’s better anyway. I cut out Mickey Mouse heads on cardstock and I also had everyone’s initial cut out. The girls taped down Mickey’s head on one side of their mug and “dotted” all around it with oil based Sharpie markers. Be careful not to get paint under the template. They did the same with their initials on the other side of their mugs. Once the paint was dried and the girls brought their mugs home the mugs were put into a cold oven, brought to 350 degrees, and baked for 30 minutes. Make sure you get the oil based Sharpies and not the water based ones! How Many Disney Villains Can You Name? We started off with an ice breaker. The girls were divided into 2 groups and they had to see how many Disney Villains they could name. There was a Disney Trivia game included in our party kit that we all enjoyed while the girls’ projects were drying. I was surprised just how much Disney knowledge the girls had and it was a great way for the girls and the moms to learn about Disney facts that they didn’t know. The trivia game really got all of us reminiscent of past trips to Disney World and excited to go back again soon. We had planned on playing Disney Bingo (from the party box) and a cup knocking over game but we ran out of time. For the cup game I had purchased bean bags and put the faces of various Disney Villains on the cups. The cups were to be stacked in a pyramid and each girl would have had a chance to knock over as many cups as she could with the bean bags. We all had an amazing time and with all the ideas I had we’ll probably host another Disney Villains party for Halloween. It’s such a fun theme. Thank you so much Disney and MomSelect!